Peptide (C)DETSSRKEKWDLR, corresponding to amino acid residues 287-299 of rat prostanoid EP2 receptor (Accession Q62928). 3rd extracellular loop. 1-3. Anti-Prostaglandin E Receptor EP2 (PTGER2) (extracellular) Antibody (#APR-064), (1:500). 4-6. Anti-Prostaglandin E Receptor EP2 (PTGER2) (extracellular) Antibody, preincubated with the control peptide antigen. Immunohistochemical staining of perfusion-fixed frozen rat brain sections using Anti-Prostaglandin E Receptor EP2 (PTGER2) (extracellular) Antibody (#APR-064), (1:100). 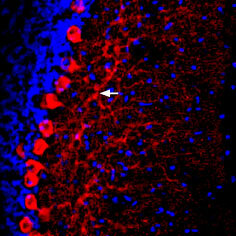 Prostanoid EP2 receptor staining (red) is detected in Purkinje neurons and their dendritic tree (arrow). Blue is DAPI nissl counterstain. ___ Unstained cells + goat anti-rabbit-AlexaFluor-488 secondary antibody. ___ Cells + Anti-Prostaglandin E Receptor EP2 (PTGER2) (extracellular) Antibody (#APR-064), (1:15) + goat anti-rabbit-AlexaFluor-488 secondary antibody. Campbell, W.B. et al. (1990) The Pharmacological Basis of Therapeutic 8, 600. Davies, P. et al. (1992) Inflammation: Basic Principles and Clinical Correlates 2, 123. Coleman, R.A. et al. (1992) Comprehensive Medicinal Chemistry 3, 123. Ferreri, N.R. et al. (1992) J. Biol. Chem. 267, 9443. Bastien, L. et al. (1994) J. Biol. Chem. 269, 11673. Prostaglandin E2 (PGE2) is involved in a number of physiological and pathophysiological events in many tissues throughout the body1. The physiological actions of PGE2 are mediated through its interaction with cell surface prostaglandin E receptors. There are three pharmacologically defined subtypes of the EP receptor, EP1, EP2, and EP3, and these subtypes are suggested to be different in their signal transduction2. These receptors belong to the G-protein coupled receptor (GPCR) superfamily. Like all members they have seven transmembrane domains with an extracellular N-terminal tail and an intracellular C-terminus. The EP2 receptor is expressed in the vasculature, the gastrointestinal tract, kidney and also in the ciliary muscles of the eye3. PGE2 is known to play a central role in the pathophysiology of inflammation in synergy with other proinflammatory mediators. PGE2 inhibits the function and the proliferation of T cells and the histamine release from mast cells by increasing the intracellular level of cAMP4. The EP2 subtype is thought to be in part responsible for vasodilation, oedema formation, hyperanalgesia, modulation of the immune system, and the breakdown of bone and cartilage associated with disorders such as rheumatoid arthritis5. Anti-Prostaglandin E Receptor EP2 (PTGER2) (extracellular) Antibody (#APR-064) is a highly specific antibody directed against an epitope of the rat protein. The antibody can be used in western blot, immunohistochemistry, and indirect flow cytometry applications. It has been designed to recognize EP2 receptor from rat, mouse, and human samples.